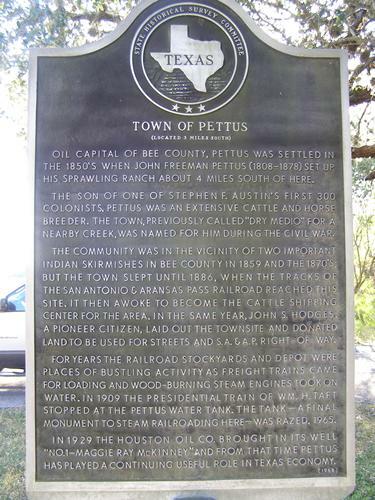 Town of Pettus, Bee County. Photo courtesy of William Beauchamp. Image available on the Internet and included in accordance with Title 17 U.S.C. Section 107. PETTUS, TEXAS. Pettus is at the junction of U.S. Highway 181 and Farm Road 623, fourteen miles north of Beeville in northern Bee County. It was called Dry Medio from its first settlement in the 1850s until the Civil War, when it came to be called Pettus City in honor of John F. Pettus, one of the most prominent of the area's early settlers. In 1886 J. S. Hodges sold a right-of-way to the San Antonio and Aransas Pass Railway and donated local streets. By 1914 the town had a reported population of 250 and five general stores, Baptist and Christian churches, a cotton gin, a blacksmith, a lumberyard, and a physician. Oil was discovered near the town in 1929, and in 1933 Pettus reported 300 residents and eighteen businesses. In 1990 it had an estimated population of 400 and thirteen businesses. The population grew to 608 by 2000. Handbook of Texas Online, Grace Bauer, "PETTUS, TX," accessed April 21, 2019, http://www.tshaonline.org/handbook/online/articles/hlp23.